There are a number of common conversion optimisation myths that must die. 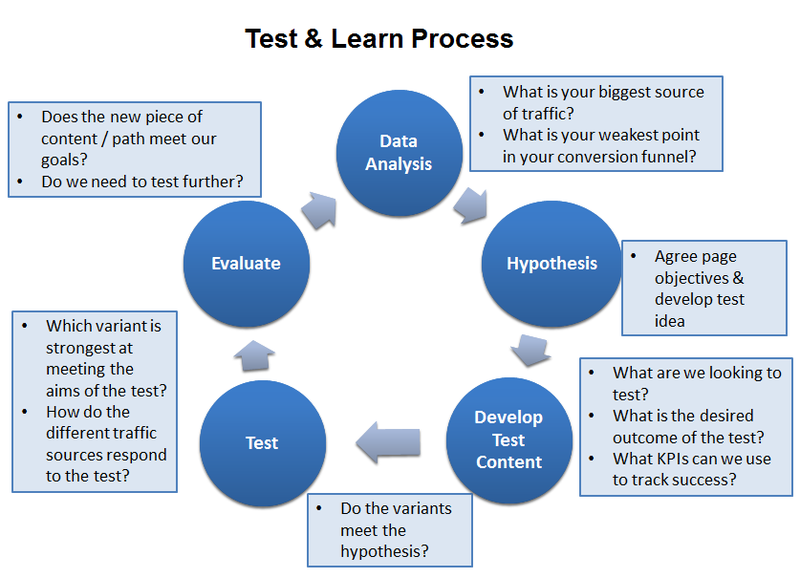 Conversion rate optimisation a strategic process that involves measuring performance and learning as we go. If we restrict our ability to learn by listening to commonly held conversion optimisation myths about design and optimisation we risk undermining the whole optimisation process. These myths must die! 1. It’s about improving the customer experience. Why are people so obsessed with improving the customer experience? This one of the biggest conversion optimisation myths. It is certainly desirable for the user experience to meet certain standards (e.g. relevance, clarity, load speed, accessibility etc), as otherwise this could harm your conversion rate. But it should not be an isolated goal though, there has to be a return on investment as there is always an opportunity cost for any expenditure. We could all create a fantastic user experience by giving free access to everything on our site or reducing prices below the market rate. But unless this provides a net-gain to the organisation we could quickly go out of business. Disney understand this by investing in their staff and theme parks to create an exceptional customer experience. However, this allows allows them to charge a premium for entry into their theme parks and customers reward Disney with huge sales of merchandise as well. 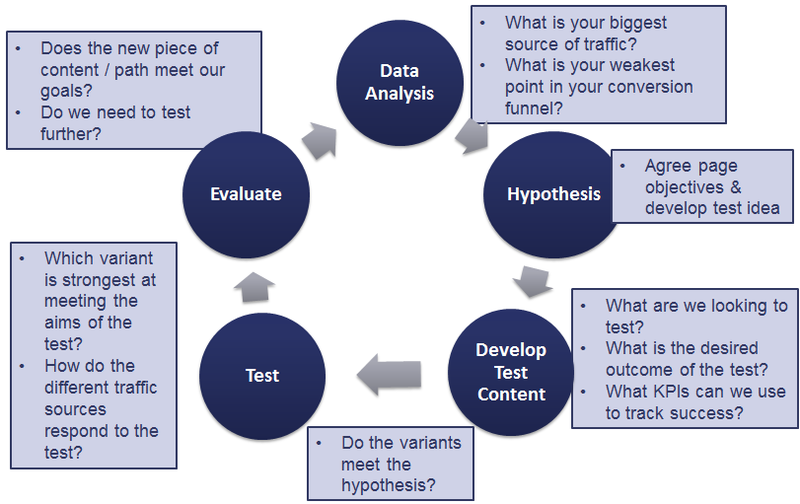 On a website or app we have the advantage that we can precisely measure the ROI though web analytics and if we have sufficient traffic we can run online experiments using A/B testing tools. We can use these tools to ensure that money spent on improving your digital experience has a positive and sustainable impact on important business goals. Otherwise use the money for something else that generates a positive return. 2. Conversion is about good design. What defines a ‘good’ webpage design is all too often based upon the subjective opinions of people within an organisation rather than the behaviour and feedback of visitors. People visit a website because they expect that it can assist them in achieving a current goal, whether it is your content or a product for sale. If your design doesn’t assist with this process then it won’t matter whether it’s a flat design or minimal style because customers won’t stick around. 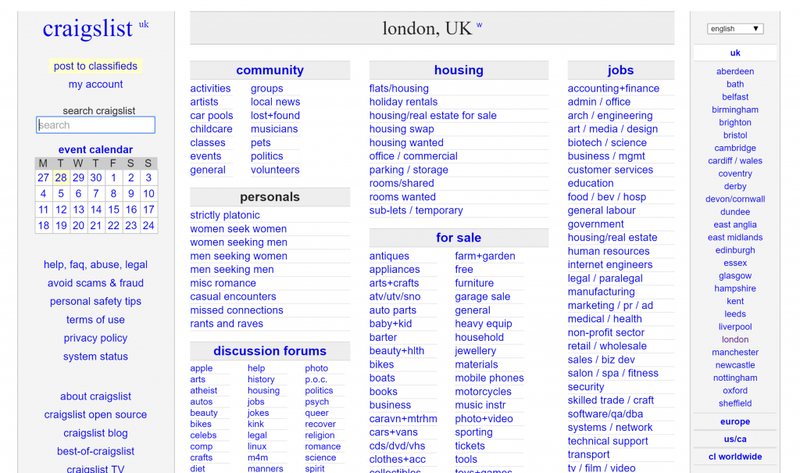 The homepage for Craigslist London below is a good example of what many designers would call ugly. But this is a very successful site. It’s functional and offers many visitors what they want and I have never heard anyone complain about the site not looking beautiful. Design is definitely important as it helps to create a good first impression, and it ensures content and navigation are presented in a way that is clear and engaging to visitors. User centred design is also a good practice for organisations to adhere to but placing design before business goals is the biggest of all conversion optimisation myths going. Design is an enabler to facilitate the user journey, and ultimately if a beautifully designed page does not help and encourage visitors to complete a key task it has failed. 3. Consistency of design is crucial. How many times a day do you hear “consistency” given as the reason for why an element on your website looks like it does or why it even exists on a webpage? This is not an answer, it’s an automatic response that hides a lack of thought and is often due to lazy thinking or design. Sure, it’s a good idea to follow major web conventions as this helps to meet customer expectations and assists navigation. But, consistency for its own sake is one of those conversion optimisation myths that are counter-productive. Do you really think your visitors are bothered if your call to action button on one page is a different size or colour to what it is on another page? Do you think they care if your site uses the same template for all your pages? I think not. Your visitor is trying to complete a task and that should be your priority, not that everything is consistent. If consistency is relevant and helps the customer meet their goal then great, but not if it is solely for your gratification and doesn’t assist the customer achieve their goal. Consistency for its own sake should not be a goal and should be challenged unless you have evidence that it is beneficial to both your customer and your organisation. 4. Brand guidelines must be adhered to. This is like saying that you won’t use oxygen to breathe underwater if you think the colour of your tank clashes with your swimming gear. If we follow this rule we are basically saying that brand guidelines are more important than the organisation’s goals (e.g. revenue generation). This is not a healthy place to be and it is one of those conversion optimisation myths that could seriously damage your site’s long term success. Brand guidelines should be ‘guidelines’ and not set in stone. They are often based upon subjective opinions and may have little evidence to support them. Like any aspect of a business they need to have a return on investment (ROI) and if that ROI is not proven it needs to be challenged and if necessary changed. Otherwise the business and the brand will not evolve in response to changing customer needs. 5. Use tips and best practice. If it was this simple we would all just follow Amazon or Google. Websites and apps are unique ecosystems that attract their own set visitors who do not behave in a generic and predictable way. When you don’t have the traffic to test on a website you may be tempted to implement changes that you have seen on another site. Ensure you get design feedback first on the new experience and if possible undertake some user research to get customer feedback. Don’t assume something that works on another site will necessarily work on your site. There is a good chance that when you copy another site they don’t know what they are doing any more than you do. Make sure you monitor appropriate metrics to measure the impact of the changes you make as otherwise you may fall foul of conversion optimisation myths. Similarly, tips about conversion rate optimisation may give you ideas for making improvements, but don’t implement them blindly. The key to any successful conversion optimisation strategy is that you follow a systematic and proven process to identity and makes changes that can significantly improve your site’s performance on key success metrics. Following tips and best practice alone will just lead to a random testing programme that lacks focus and will probably fail to deliver consistent and sustainable results. Your key conversion metric is just one indicator of many that shows how your site is performing. It should not be viewed in isolation from other KPIs. Use your web analytics to monitor other relevant metrics such as average order value, returning customer orders, or overall revenues. Any improvement in your conversion rate needs to be sustainable and provide an overall net gain to your business as otherwise it is meaningless. You should identify a single success metric for optimising your site, but you still need to keep this in context by monitoring other important metrics to ensure you are not damaging more long term metrics. If conversion optimisation was all about the conversion rate we might use dark UX design patterns to trick visitors into making decisions that may not be in their best interest. 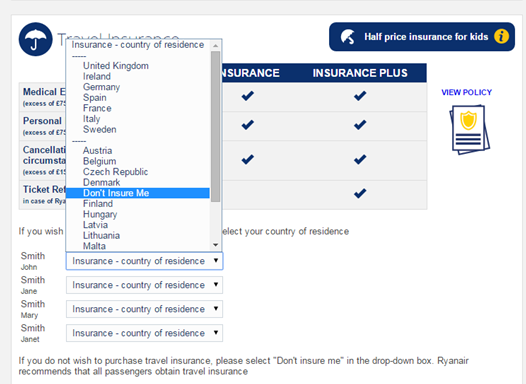 A few years ago I used Ryanair’s website and found they employed dark UX patterns. Ok, but the “Don’t insure me” is not at the top of the list of options because that would be too easy. Nope, it’s between “Denmark” and “Finland”. You also have to select this separately for each passenger because it is under country of residence. This is not an enjoyable experience and it made me more alert to any other money-making tactics that Ryanair might use. The whole experience was counter-productive as it made me look to other airlines to avoid having to use their website again. So don’t get obsessed with your conversion rate as otherwise conversion optimisation myths can lead to dark UX patterns which can damage your reputation. See it as one of a number of important indicators of your site’s health. Focus on what is best for your customers and this will normally be the best strategy for the long-term sustainability of your site. These common conversion rate optimisation myths can undermine your growth strategy and so avoid making these mistakes. Focus on establishing a systematic framework for conversion optimisation and use data to inform your optimisation programme. The most successful optimisation programmes make extensive use of user research and analytics to identify real insights rather than relying on tips on the internet. Put most of your effort into using these sources of insight and you are much more likely to succeed. Thank you for reading my post. If you found it of interest please share this post by clicking on the social media icons below. Recommended reading: You Should Test That! by Chris Goward.